For many sick children, access to life-saving treatment simply depends on where they live. 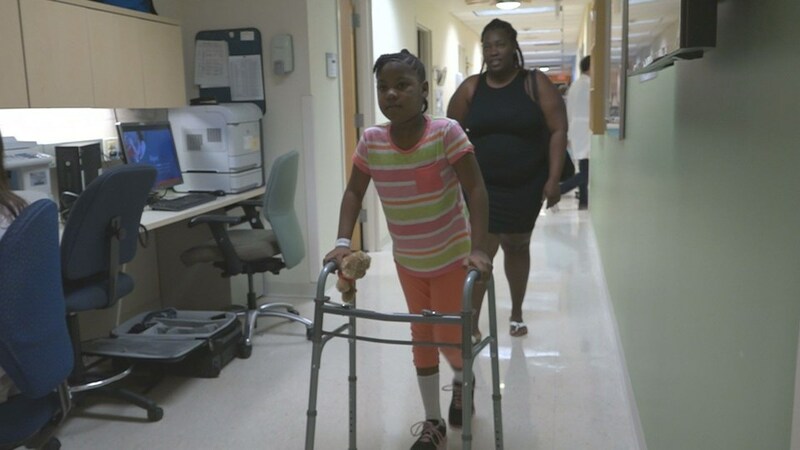 Francesca Mya Mathurin, who likes to go by her middle name “Mya,” traveled thousands of miles to St. Louis get treatment. The family lives on the Caribbean island of St. Lucia. After many initial tests failed to find a problem with Mya’s health, doctors there spotted a cyst on her spinal cord thanks to an MRI. On the island, her options for surgery were limited. “She had become paralyzed, flaccid, so she had no strength or tone whatsoever,” explained Dr. Philippe Mercier, a SLUCare Neurosurgeon at SSM Health Cardinal Glennon Children’s Hospital. Dr. Mercier connected with Mya through an international organization called World Pediatric Project. The group identifies children living in countries that cannot provide the treatment they need and connects them with health care professionals in the U.S.
“We bring them in primarily from the Caribbean, Central America, kids with complex medical and surgical problems that will just never get that care at home,” explained Dr. John Peter, the Chief Medical Officer at Cardinal Glennon.